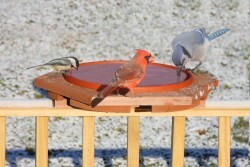 Bird Feeders Made in the USA by Looker Inc. Our clients include over 650 specialty stores nationwide. 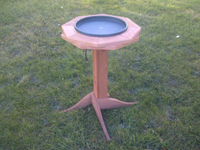 Looker is a leading manufacturer of Heated Bird Bath. Green Heated Pan is 1-1/8" deep. Beautiful double ring made of Western Red Cedar comes with a hollow post (to hide electric cord), hardware, and 4 hold-down stakes. Having to refill the bath at least once a day is normal! Summer pan in now sold seperately! Summer pans available in Green SE704 or Clay SE705. Triangular mounts are adjustable to fit most types of deck rails or fence post. Summertime pan sold seperately in green SE704 or clay SE705.